The Leroux is the largest floor plan at Trails End. The Leroux is a 1,678 sq. ft. single-family home with 4 bedrooms and 3.5 bathrooms with optional garage. This split-level home is designed with living room, dining room powder room and the master bedroom and bathroom on the first floor. Bedroom #2, Bedroom #3 and Bedroom #4 are located on the upper level with 2 full upstairs bathrooms. 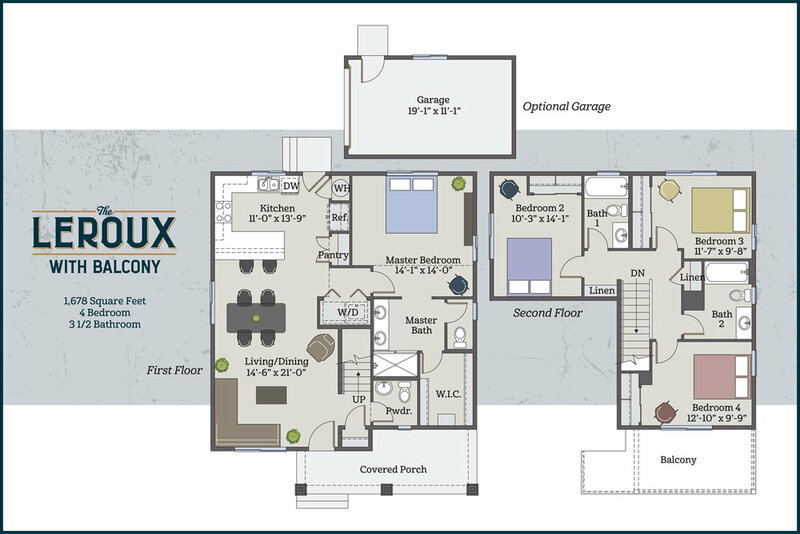 The Leroux is the largest floor plan at Trails End. The Leroux is a 1,678 sq. ft. single-family home with 4 bedrooms and 3.5 bathrooms with optional garage. This split-level home is designed with living room, dining room powder room and the master bedroom and bathroom on the first floor. Bedroom #2, Bedroom #3 and Bedroom #4 are located on the upper level with 2 full upstairs bathrooms. The Leroux with Balcony offers a full covered balcony off Bedroom #4 on the second floor.